Sydney Shop Girl: Have You Heard About the Beige Coloured Polo Shirt Catastrophe At SSG Manor? What I've Been Up To Recently. Have You Heard About the Beige Coloured Polo Shirt Catastrophe At SSG Manor? What I've Been Up To Recently. How's life in your neck of the woods? Just enjoying some time off? Or, if you're at work, is it kind of slack? Isn't it nice leaving later for work and not having to contend with traffic and being able to find a good parking spot? Almost makes being at work in the middle of the festive season... fun. I haven't been up to much exciting since my last post. Though, there was the incident where my pink polo shirt had a nasty run in with my khaki tie dyed dress in the wash. The dress is still khaki and the shirt is now beige with a khaki coloured horse. Mr SSG felt sorry for me because he was in charge of the washing that day. He googled the search terms 'husband + doing the laundry + brownie points (hmmm) + colour running + pink polo shirt + distraught wife" without much luck. We've rewashed the shirt 3 times now and I've been peering into the window of our front loader hopefully saying 'it's a girl' but nope, it's still beige. I've been too distraught to photograph it, even for the sake of the blog. So then Mr SSG volunteered to buy me a replacement. So we went online and agreed that the Ralph Lauren ladies sure know how to make a humble polo shirt look glam. We disagreed on the utility of design your own baby Ralph Lauren gear. I have some baby gifts I need to buy and I was sorely tempted. (Un)fortunately, the US site still doesn't ship direct to Australia. The current proposal is that Mr SSG high tails it to the the store in the QVB tomorrow after work and buys the replacement from there. Watch this space. Not everything beige is in my bad books at the moment though. 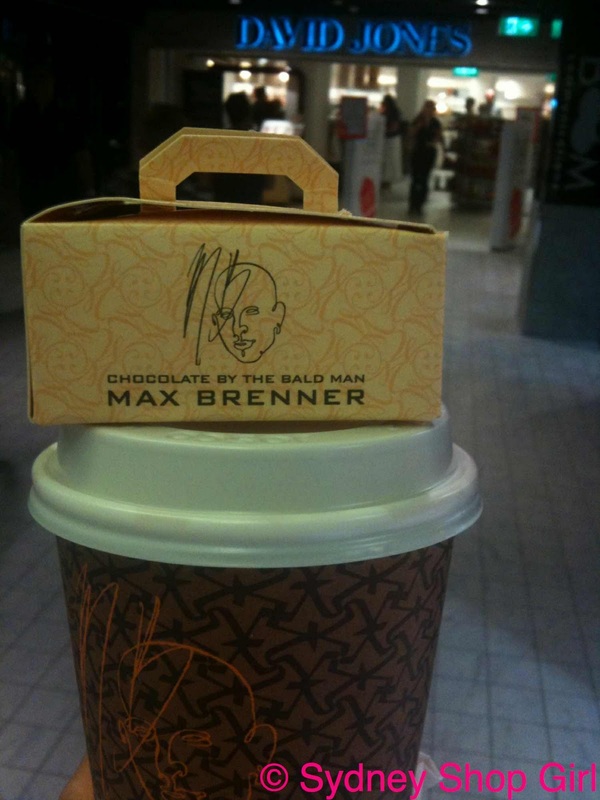 After a year of serious consumption of Max Brenner's dark chocolate mochas (skim and large), I finally filled in all 10 squares of my frequent sipper's card and scored a 4 pack of Max Brenner Pralines. Here we are outside DJs, in the Westfield. Where I was researching the price of the Mulberry Bayswater. It's highway robbery, readers. Highway robbery. The Australian price is twice the price of that on NAP and that's including shipping through NAP. It's even a tax exempt purchase because it comes in at under $1000 AUD. Gerry Harvey, I am finding it hard to be sympathetic to your cause at the moment. Goods are already so over priced here and our local online shopping sites are not great (with a few exceptions) in comparison to what overseas retails routinely offer. The pralines went down a treat whilst I read my new cook book from my brother and sister in law. It's the new AWW cooking bible. 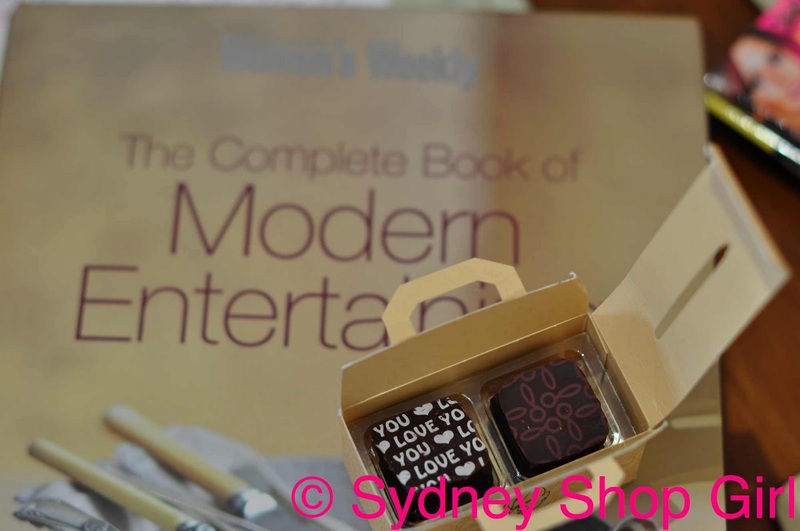 Called The Complete Book of Modern Entertaining, the chapters are creatively divided into different kinds of meals (including Girls Night In with sub topics like 'detox') with clear instructions, prep times and nutritional information. I've picked out a chapter for when H (my little brother) comes to town. Oh yes, I've been to my local KFC twice this year. Both times in my pyjamas, and the same pyjamas at that. 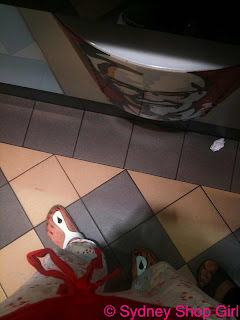 In both cases, I have been the oldest (and only) person in the restaurant wearing pyjamas. Perhaps I need to head in a little later, like 11pm or so, to not feel so... under dressed. Still, at least flannel PJ bottoms are more apropriate than say legging or jegging as pants. Here I am with Mr SSG on December 28 2010. It was a weird summer evening, rather cool. Hence the flannel PJs and Birkis. The wonders of having a photographic archive on my laptop. Here we were on June 15 2010. Same PJs because it actually was winter. 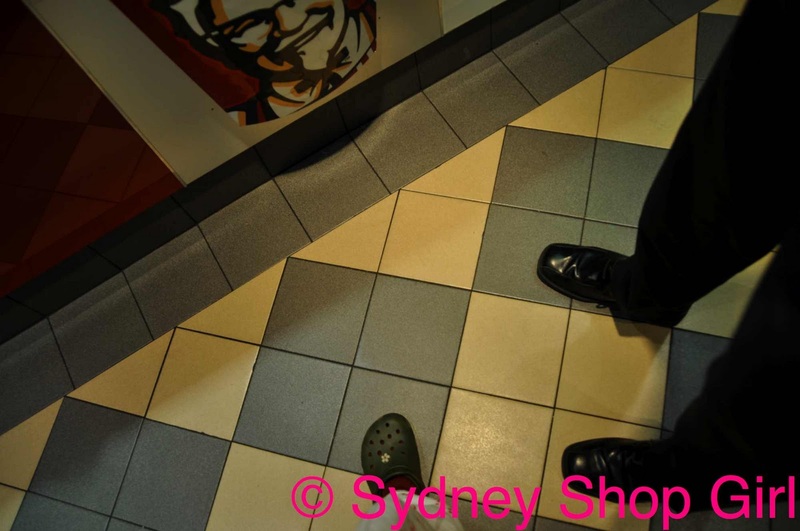 Only this time with explorer socks and Crocs. Oh heavens, those are woeful sartorial decisions. I need to put more thought into buying that Bayswater in oak off NAP. With attention drawn to the bag, perhaps my clothing indiscretions may be overlooked? Ooohh...that's too bad what happened to that polo. I hate it when I manage to ruin clothes. Usually I'm very meticulous when sortng the laundry, but every now and then something dark slips trough. I despair every time! Hehe you are too funny SSG. I don't think I've ever ventured out in my PJs but never say never! Am a big fan of that cookbook and all things Women's Weekly! I've just discovered colour catchers and they have changed my life. Not sure if they're in Sydney but worth a try, maybe Woolies online? They're just small pieces of fabric that go in with the wash and your colours will never run again. Amazing. Sydney is SO expensive, it's extortion and ridiculous. And (this is a really long comment isn't it) can I just say that I can't do beige. My school uniform was beige and I spent 7 years looking like I had recently drowned. And I know everyone loves camel at the moment (maybe just in London?) but if I wear camel I actually remind myself of a camel. This Mid 30s Life: thanks for the rec. I too had a beige uniform, except it was called biscuit and we had biscuit coloured ankle socks to go with the beige check out chick uniform in the summer. In winter, we transitioned to biscuit / beige RIBBED stockings with bottle and apple green gear. Hot. SP & Sniff: I hope that my current pain will prevent us all from having a similar experience happening again. After receiving a pro mixer and food processor for Christmas I'm on a bit of a cooking rampage. Am on the lookout for interesting cookbooks, so I'll have to check that one out! Oh, and I second that leggings, and jeggins, should never ever be worn as pants. *shudder* Happy New Year SSG! Is it a nice beige? Or a beigey beige? I think I need that cookbook! Totally agree re the pricing being outrageous here. Got back from NYC and Spouse walked into the new Gap at Westfield and was so irritated he rang me (trust me, shopping doesn't feature in his repertoire often) to say 'they are selling the same stuff at TWICE the price'. Ridiculous. AFW: even our collective Nana Aesthetic would detest the beige my shirt has become. Tiffany: hello, thanks for stopping by. Spouses are very good at this price thing. 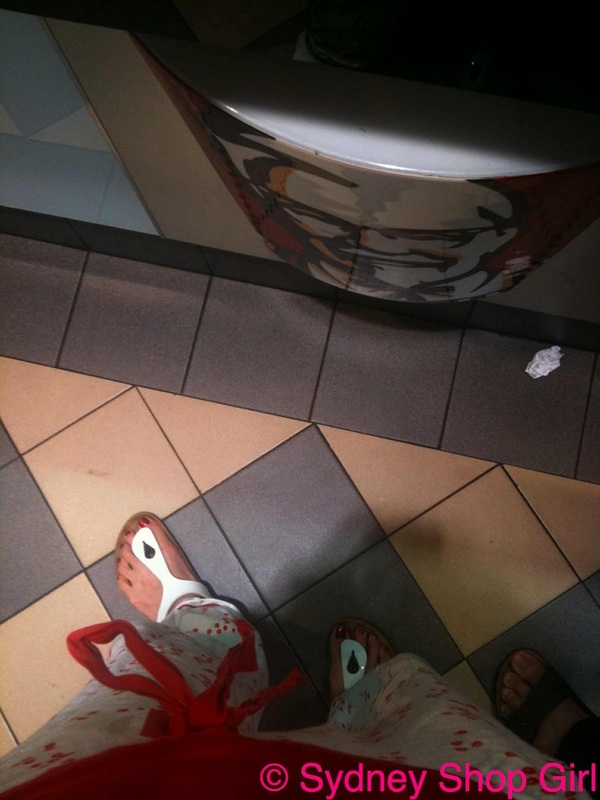 Perhaps if you buy the Mulberry bag, your pj pants will be overlooked in KFC. Diversionary tactics I call this. My diversionary tactic is to wear a low cut top so everyone will be admiring my bust not staring at my 'sunburnt' face. 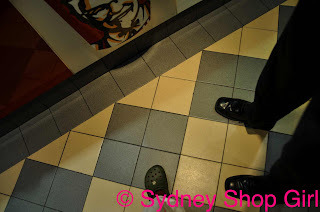 Though if you do go to KFC with the bag, they may assume you want to upsize to a combo because your bag is a luxury item. Thanks so much for your kind words. I am in still in shock and can not believe life can be this cruel.